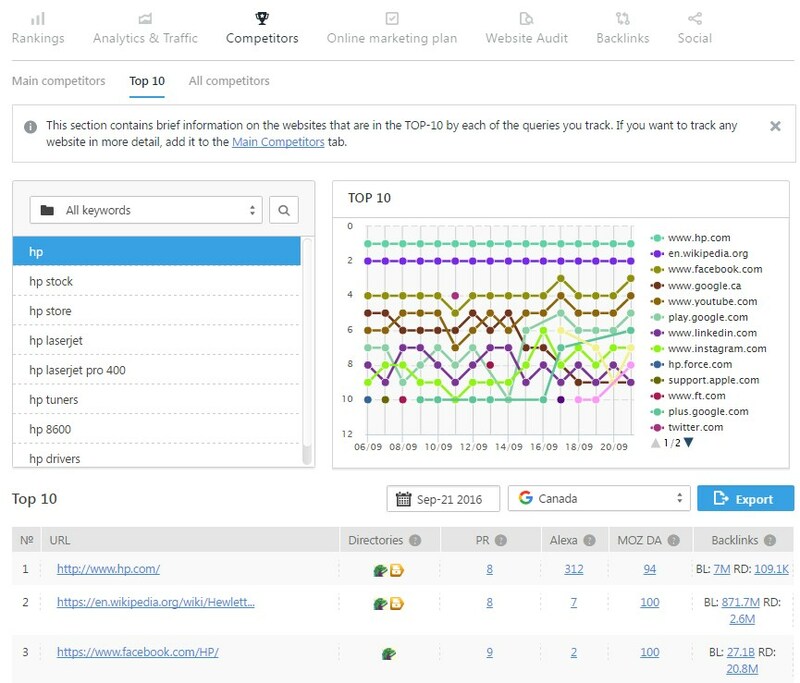 SE Ranking improved the process of monitoring competitors in search engines. We’ve added more functions to get more detailed information about your competitors. It helps to boost your website performance and simplify SEO work for getting high SEO rankings by a great number of keywords. So, on the following tab you can find the following information. 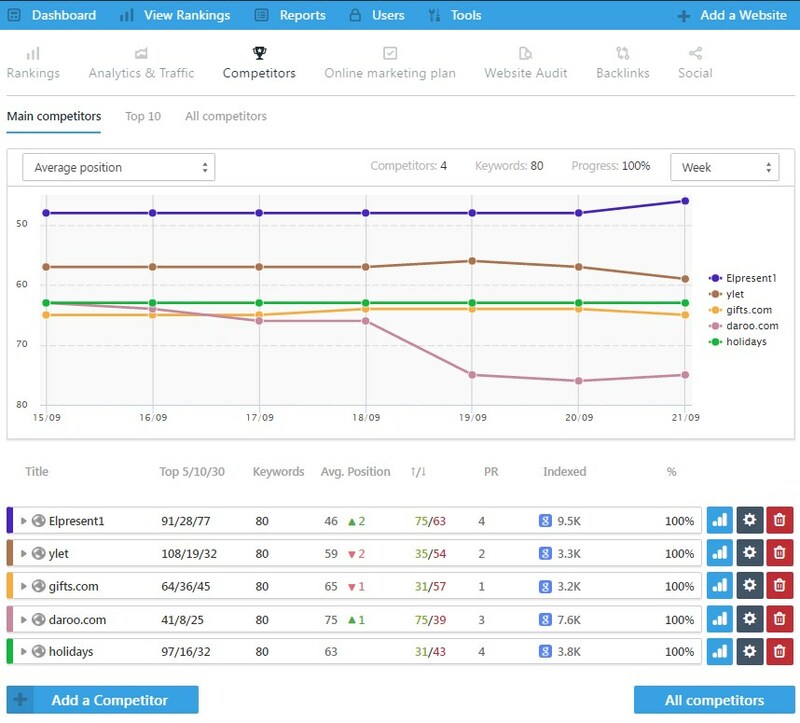 This section allows you to get stats of 5 competitors by keyword positions that you need to add manually. All statistics will be collected on the same search queries and in the same search engines that you use for your website. Moreover, you can find out about search visibility and get traffic forecast from search engines. For each tracking keyword you will get TOP 10 of search results. We’ve decided not to limit just a list from 10 resources, we’ve decided to add more useful information: IP address, its availability in popular directories (DMOZ), PR. If these websites have web counters that are not close from outside websites you can get information on website traffic. Without a shadow of doubt, you can all these data from any search engines. All the data are stored within 14 days. I guess in future we are going to increase this term. On the given page we’ve collected all websites that get top ranked results in search engines by each tracking keyword. These websites are your main competitors. For sure, there are many projects, but don’t be lazy to look though all web pages. It will help you to take your attention on a new competitor or don’t skip rank improvement of your old competitor. Check the tab “All Competitors”. Choose those websites that are related to yours one. Explore the chosen websites. Take some interesting ideas, for example, about usability, on page and off page optimization. Go to the tab “Top 10”. Learn all given resources in the same way. Choose the suitable resource by keywords for you. Select 5 main competitors and add them in the section “Main Competitors”. Check regularly their changes of rankings for selected websites. Compare their decline and improvement with the changes of your websites.